Ben Simmons highlights are so good, you should have to tank to watch them. Ben Simmons, on his way to do something cool. Look what tanking hath wrought. 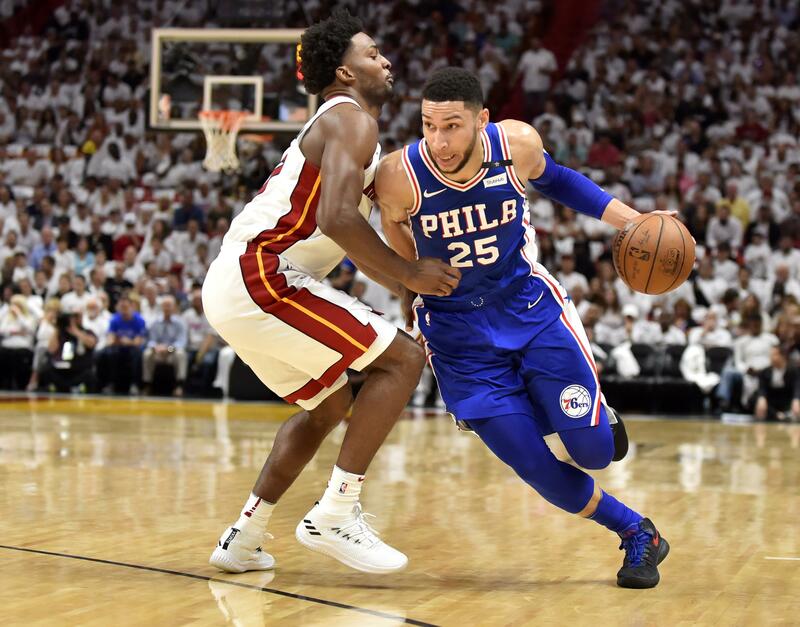 The Philadelphia 76ers beat the Miami Heat 106-102 on Saturday to take a 3-1 series lead, and they look as sharp a team as any in the Eastern Conference. Point guard Ben Simmons stole the show in Game 4, posting a nifty stat line of 17 points, 12 rebounds, and 10 assists. He became the first rookie to record a triple-double in the playoffs since Magic Johnson had one in 1980. With the way Simmons has been playing, it’s a surprise it took him four games to reach that milestone. There’s an old saw that good teams win games even when they play poorly and, going by that logic, the Sixers proved on Saturday that they are indeed a good team. Philadelphia turned the ball over a generous 27 times, star center Joel Embiid struggled offensively, and they missed 24 of their 31 attempts from 3-point range. Still, the Sixers prevailed. For a good chunk of the decade, Philadelphia as a franchise purposely tried to lose as many games as possible. Now, they can’t lose even when they probably should. Of course, all the losing of the infamous “process” era resulted in high draft picks and players like Embiid and Simmons, who make the Sixers a team to both envy and fear. Simmons has been especially rowdy in his first-ever postseason series, and Saturday’s triple-double was merely the continuation of a trend. At 6-foot-10, playing him at point guard is like using a sledgehammer to fluff pillows, and he turned the Miami defense into a mound of feathers on Saturday. The Sixers finished the regular season with a 16-game win streak, and nine of those victories were without the then-injured Embiid. Simmons was instrumental during that streak, and he will likely win Rookie of the Year due to those late-season performances. Did I fail to mention he is a rookie? Well, he is, meaning the rest of the league will have to deal with this kind of stuff for the next decade or so. Ben Simmons finds Amir Johnson through traffic! Simmons’ only weakness is his jump shot, though it forces him to get creative when driving to the hoop. It almost makes you hope he doesn’t polish that jumper, just to ensure he keeps producing these kinds of highlights at a steady clip. A silky point guard who can throw down dunks like Dominique Wilkins and thread passes like Magic Johnson just isn’t fair. While the NBA is reforming its draft lottery process in 2019 to prevent the kind of tanking that delivered Simmons to Philadelphia, it’s too late to do anything about the star point guard. He’s already here, and he’s going to be a problem for a long time.